I am no baker. I can bake salmon, protein bread & banana bread (not at the same time, of course) but that's about it. So this one's for her- and any other readers who may be interested. I just came home from visiting my family in IL where there is always lots of eating going on and we can always count on Grandma Betty having something sweet for us to have after dinner. She shared these recipes with me one night out of her church's cookbook (Heavenly Delights- clever) She told me that her pies are always requested to make an appearance at any church function and normally she does something with a meringue topping. Beat egg whites with cream of tartar until frothy- gradually add sugar 1 tbls at a time. Continue to beat til stiff and glossy. Pile meringue on filling being careful to spread to the edge of crust- adds peaks. Have egg whites at room temperature. Cook water, cornstarch and sugar. Cool and add to stiffly beaten egg whites. Add salt and vanilla. Top pie and brown at 350* for 15 mins. I've been going back and forth on what to post for my next recipe, and it's decided.. chocolate pie! Which is usually made with meringue! Mmmm, meringue! 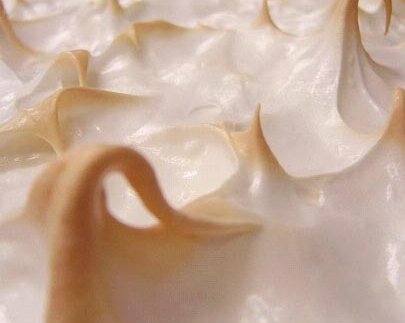 Cream of tartar is a popular ingredient in the UK, but it's pricey in North America, which is probably why I see a lot of meringue recipes with vinegar in it instead. I wonder why the second doesn't have an acid ingredient in it?